Home » Culinary Journeys » Alimentos Charla – When Food starts talking! Alimentos Charla – When Food starts talking! Eat, drink and be merry for tomorrow the world will end! Can’t let go without writing about Spanish food. I have lived in America for a few years, and I have always almost had “Mexican” food. I’ve hardly heard anyone say “Hey! Let’s eat Spanish food tonight!” No, usually exotic tastes tend toward Mexican or Chinese or Lebanese or Italian or Ethiopian. Ok..maybe just a couple of restaurants here and there that serve the conspicuous ‘Tapas’. I think there’s a reason for this. Spanish cuisine is different from just about anything else. It doesn’t have the flashy flavors of chili-peppers or the loud hint of cumin powder. It hasn’t been mainstreamed like pizza,gyros or burritos. Instead, Spanish food is infused with more subtle, more earthy flavors of olives and saffron. It is different, but oh, it is delicious. Every night before dinner, I would sit down with Kuki, watch the local “Alphabet Game” called ‘Pasapalabra’, while her Dad,Tehano would bring out a big wedge of queso manchego, a regional cheese made from the milk of sheep or goats. This nightly ritual is one of my favorite memories from my time with my host family and fittingly queso manchego is one of my favorite foods from Spain. You should visit Kuki’s house, when you get a chance. 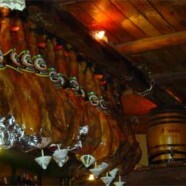 Ham is Spain’s second religion (a little behind soccer but probably slightly ahead of Catholicism! ); it is cherished as much as champagne is in France. The process for curing Iberian ham is a lengthy process that takes a couple of years. There are various grades of quality, the best being pata negra(black hoof) or de bellota, which is made from pigs that are reared on acorns. Chorizo is a spicy sausage, either sliced thinly and served cold in a bread roll or cut into chunks and cooked in wine(al vino) or cider (a la sidra). Sometimes you will be served mini chorizos, called choricitos.I swear by pork,sometimes literally-so I couldn’t let this article pass without a mention of this. My Andalusian nights would have never been the same without the kind hospitality of Kuki’s family, and the influence they have had in making me feel Spanish all over again. I’ll take you along if you want me to…Step here for Spain-ing Away!